This is my entry for the July Craft Challenge for the Halloween Year Round group on Swap-Bot. 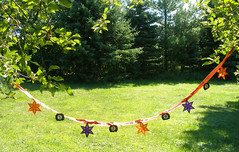 I made a 9 foot Halloween garland using ribbon (for the garland itself), kite paper (for the 5 translucent origami stars), cardstock for the 4 pumpkin outlines, and 4 vintage image stickers on different colored printed paper (scrapbook paper). The stickers feature a jack o’lantern, cat, and owl. ~The Shape of a Star – There are 5 stars that are made with translucent kite paper. Each point (of each star) is folded 11 times, and then glued to another point. So, to create one 6-pointed star, I needed to do 66 folds. With 5 stars…that’s 330 folds. ~ The Date “October 31st” – The date is handwritten on the ribbon in permanent blank ink. This is available in my shop, Harvest Moon by Hand.